At the recent Photoshop World in Las Vegas, I started a new series of interviews for O'Reilly Media where I sit down with imaging experts and ask them about their craft. These chats were recorded and are now avaiable, unedited, on O'Reilly's Digital Media site. The first three interviews -- Stephen Johnson, Mikkel Aaland, and Deke McClelland -- are posted now on the Inside Digital Media podcast page. More interviews will go live weekly. Stay tuned! 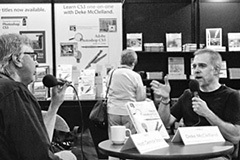 Photo of Derrick Story interviewing Deke McClelland (right) at Photoshop World 07 in Las Vegas.